Happy Black Friday. We’re continuing our gift guide series with eight great ideas for Apple Watch owners. 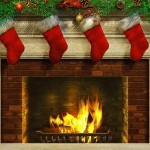 And make sure to keep checking back, as we’ve got a number of other accessory gift guides planned to lend a hand during the holiday shopping season. Even though the watch has only been on the market since April, there’s a number of different charging docks to select from – even an official version from Apple. But one of the best, so far, is Griffin’s WatchStand Powered Charging Station. 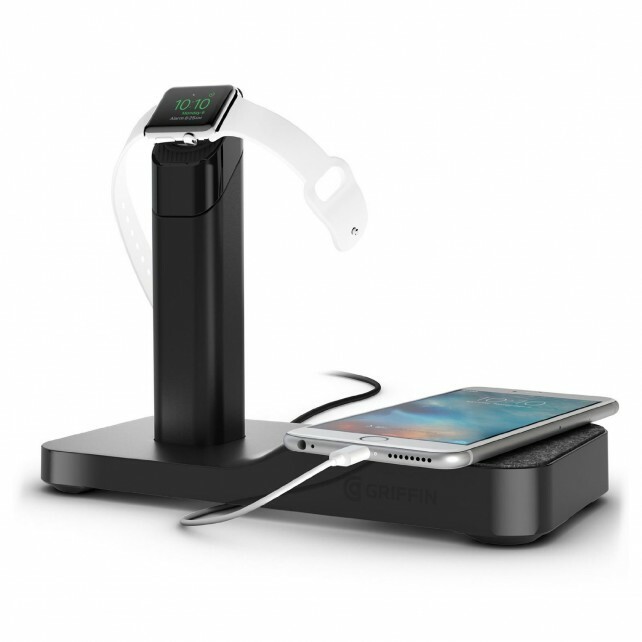 As a nice plus, users can charge both their watch and iPhone using the stand. Your watch is held on a slight pedestal that also completely hides the charging cord. The watch can be charged in both landscape and portrait orientation so you can take advantage of the Nightstand Mode in Watch OS 2.0. Any iPhone can be placed on the stand’s angled cradle in a nice viewing position or flat on a felt platform. The standout feature of the stand is its two built-in USB ports on the bottom of the device. Any excess Lighting cable can be hidden using the cord management in the stand’s base. It can be purchased now for $59.99. A similar version, without the USB ports is $30 less. You also don’t need to depend on Apple’s additional strap choices to change up the look of your watch. One of my favorites has been Nomad’s strap. 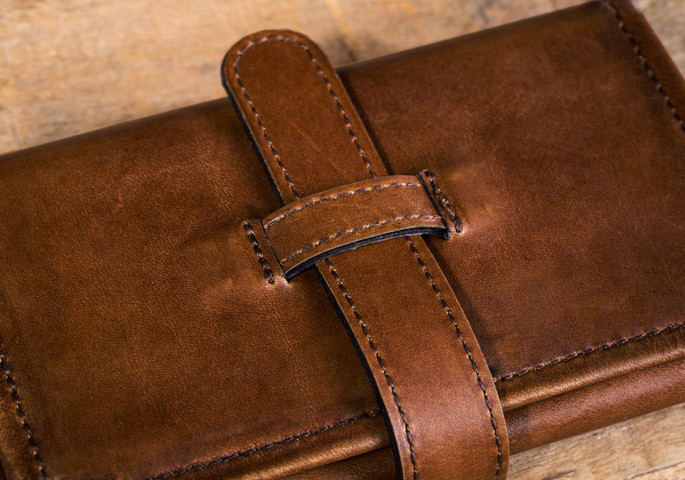 It is made with raw, unprocessed, and unsealed leather from an Italian tannery. When it arrives, the leather should be light brown and very soft to the touch. 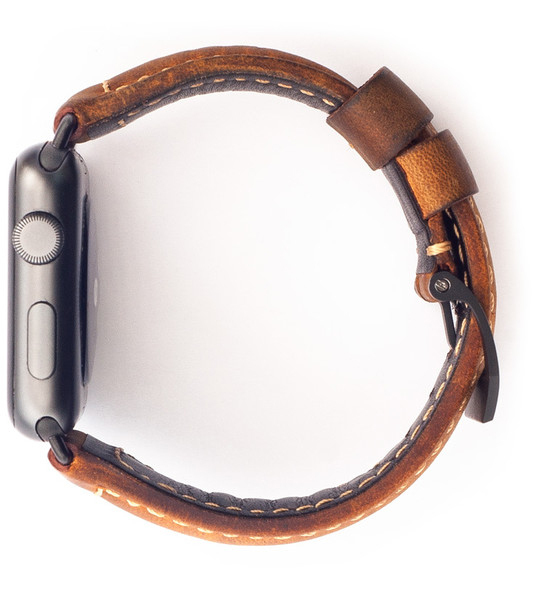 But after wearing it for a few weeks, it will turn a darker shade of brown and develop its own unique patina. And along with the beautiful leather, the band itself is made to stand the test of time with nice touches like reinforced eyes and heavy duty, two-tone stitching. You can order the strap now for $119.99. Shipping will begin next week. 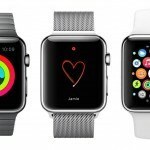 It’s only compatible with the 42mm watch and buyers can select from stainless steel or space gray hardware on the strap. A simplistic option, the Bluelounge Kosta works similarly to Apple’s official – and much more expensive – dock. 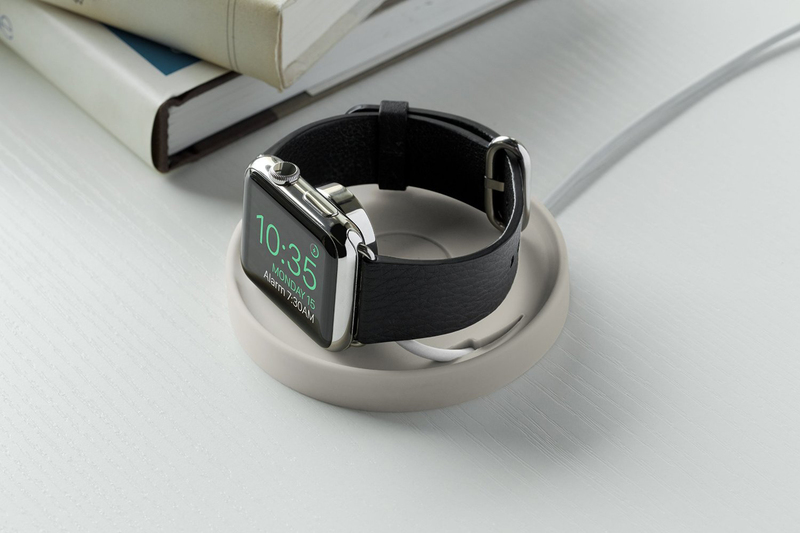 Officially dubbed a charging “coaster,” the small and round dock is made with a flexible material. Kosta literally takes seconds to get up and running. Simply insert the charging cord disc through the top and you’re ready to go. 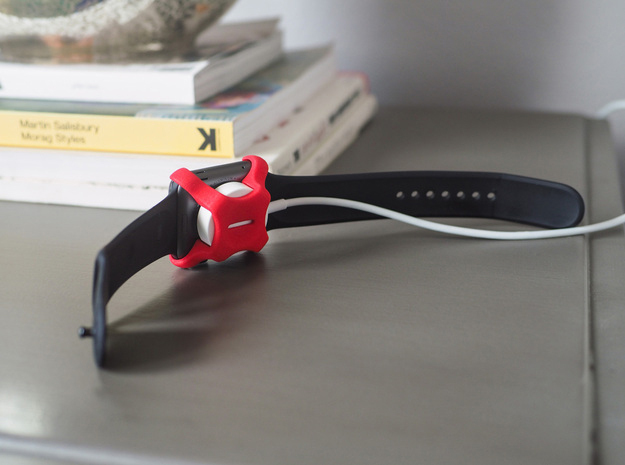 It’s made with silicone so it won’t slip or slide around your desk or scratch the watch. Thanks to a built-in magnet in the center of the coaster, the cord will always stay in place even when you’re not charging a watch. When it is charging time, you’ll just need to place the watch in the coaster and flip the disc up. It’s that simple. There’s no charging cord management feature, but it’s not exactly a surprise given the coaster’s small form factor and inexpensive price. It can also charge a watch in Nightstand Mode. A dark gray, light gray, and lime green version of the Kosta are available to purchase for $14.99. Originally starting as a Kickstarter project, WatchPops can give a bit of flare to your current Sport Band. Inspired by men’s cufflinks, they are buttons made from black or silver anodized aluminum that can fit into the unused holes of the Sport Band, or any other third-party band. There are tons of different styles to choose from. You can snag one for $12, two for $22, four for $40, or six for $54. If you’re interested, you can read more about them in our original review. An inexpensive option to Apple’s Classic Buckle, my colleague Karen Freeman reviewed MakerGrafix Custom Leather Band back in June and really enjoyed it. Buyers can select from one of four different colors – black, brown, red, or white. Along with the high-quality material, you can personalize the back of the strap with whatever text you’d like. 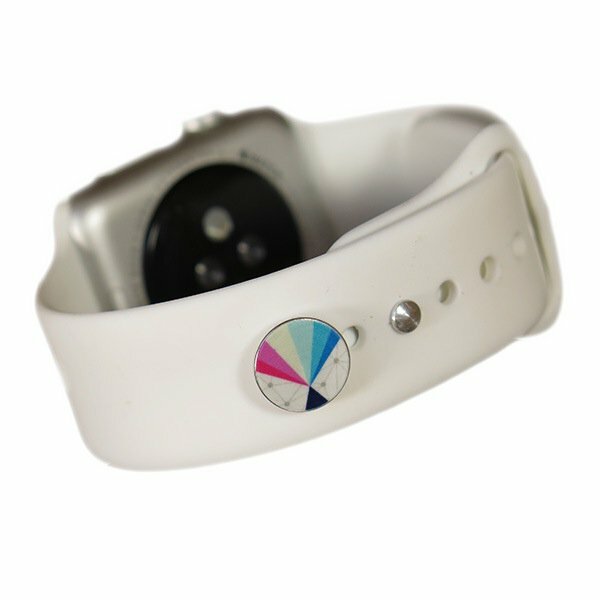 The band will set you back $49.99 and can be ordered now directly from MakerGrafix. 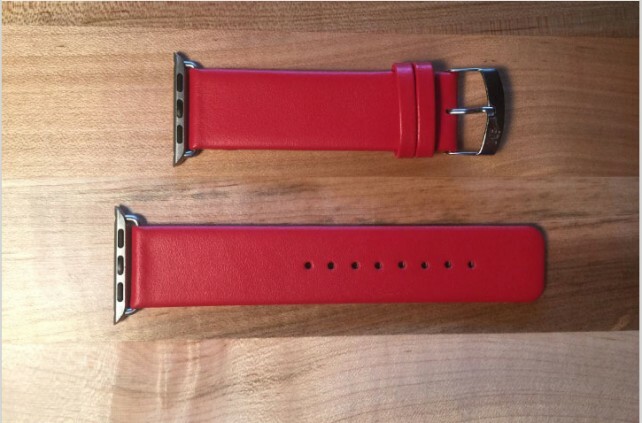 You can select from a 38mm or 42mm band with either stainless steel or space gray hardware. A great way to travel with your watch, Pad & Quill’s Roll Up Kit is made from full-grain American leather with a 25-year warranty. Along with an extra strap, it also has more than enough room to hold the watch’s magnetic charging disc. The interior is made with a soft and durable lining that will protect the contents from scratches. A leather closure helps keep everything safe and secure. It can be purchased now from Pad & Quill for $49.99. 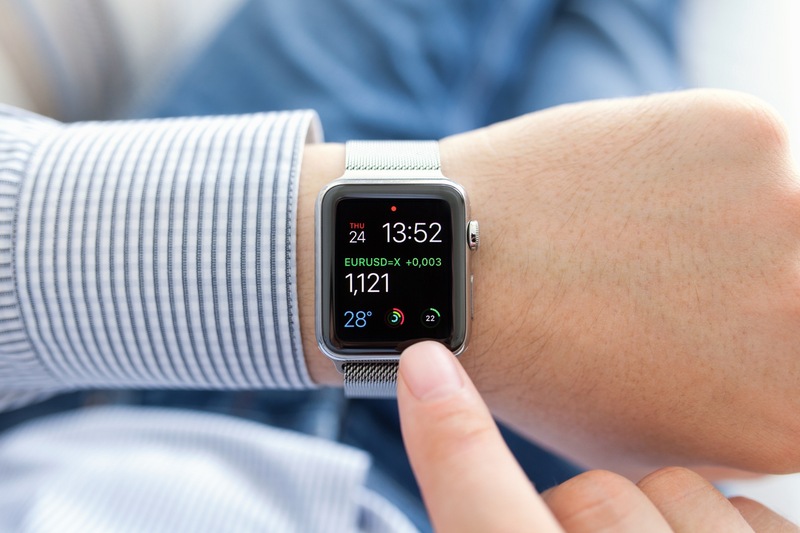 While the magnetic inductive charging system of the watch is handy, most users have figured out that the charging disc can easily be dislodged from the back of the device. But Studio Neat has designed an interesting way to make that connection a little more secure. As the name suggests, the charging clips attaches to the disc. It then attaches to the back of your watch more securely. Each clip is 3-D printed to order and costs $10. You can select from a version for the 38mm or 42mm watch. Buyers can select from nine different colors – everything from metallic silver to orange. Just to note, the clip does work with both the plastic charging disc bundled with the Apple Watch Sport and the metallic version that comes with the Apple Watch and Apple Watch Edition. 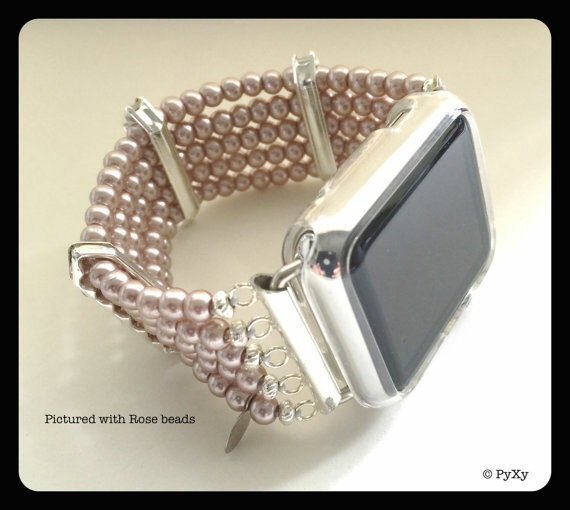 Designed to better match women’s formal wear, PyXY’s band features five strands made with genuine Czech glass beads along with rhinestone spacers. The band costs $55 and can be purchased from the PyXY its now. It’s available for both the 38mm and 42mm watch. Buyers can select three different colors of beads – smoke, mint, and rose. The watch adapters are designed to match the stainless steel Apple Watch. How often do you glance at your Apple Watch?